It isn’t every day that you encounter people who would be willing enough to introduce you to worm composting. In fact, one may just take ownership to his knowledge regarding the topic but since everyone wants to be green, then we’re now part of the advocacy. This, just like any other process requires certain things. Number one of course is the composting worm. Without this, then you can never even begin with step one. So how do we choose the best worm for our compost? First, forget about the earthworms in your garden. You may think that they will do but the truth is, they won’t be of great help. We recommend Eisenia fetida or commonly known as Red Wiggler worms. You would also need of course a shelter for these worms which we will call the worm bin and for a better home, you have to give them moist bedding. We will discuss the following as we move along. Well, you do not want to just place your worms inside the bin without proper bedding, do you? It is important that before you even transfer the Red worms, everything is perfectly fine. To begin with, look for materials such as frazzled newspapers, moistened stripped cardboards and leaves that are not fully decomposed. With all those, be reminded to keep the bedding moist. Never leave it dry or too wet because it may endanger your worms. Also, know that you should have different kinds of beddings for your bin because it will make your red worms more comfortable. Remember to change the bedding regularly. Never ever crowd the bin with too much beddings; it will make your worms irritable. Use this as a guide in feeding your worms. Research shows that red wiggler composting worms do eat as much as their body weight. So from that, measure the organic wastes that you are to give them everyday. Never over feed them. Giving them too much food scraps may eventually lead to their death. They can adjust to small amount of foods sometimes but giving them too much is not a good idea. Also, know what to feed and not to feed them. Know-how with regards to this matter is very vital. First take note of the things that are not good for them. This includes vegetables and fruits that were sprayed with insecticide or pesticide. Second, please spare your worms from plastics, meat and meat bones. Never attempt to try feeding them with dairy products or anything that may also cause insects to attack the bin. Put these things in your list though. Speed up the process of worm composting by chopping or cutting into strips your kitchen scraps like vegetables and fruit peelings. If these are no longer available, you can resort to grass clippings rather than throwing them in the garbage. Tea bags and corn husks will also do. To make the know-how procedure perfect, learn the right temperature for your worm bin. Don’t expose them with too much sunlight or with too much rain. Keep it at 40-90 degrees to ensure proper ventilation. 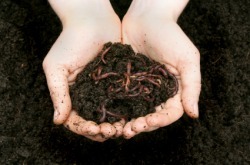 You may have the worm composting process inside or outside your house. What matters is you know how to manage. If indoor, all you need to do is keep the bin in your garage, kitchen or your basement. So there we go! You are now prepared to have your vermicomposting at home. You may buy red worms to start with this. Enjoy and be productive with your worm composting trip!